The Ethiopian Construction Works Corporation (ECWC) which is a result of a merger between the Ethiopian Road Construction Corporation, Ethiopian Water Works Construction Enterprise and Ethiopian Prefabricated Building Parts Production Enterprise is incharge of the construction. The Dam project once complete will become the ninth to onstruction, beginning 2010 but the completion period was modified after the need to redesign the Dam to fully utilize Gidabo river’s potential as well as increase the Dam’s capacity,” said Abdulfetah Taju, project manager overlooking the dam construction..
Apart from improving its capacity, the new design includes two channels sprawled on 1,050ha close to the Borena and Sidama zones. 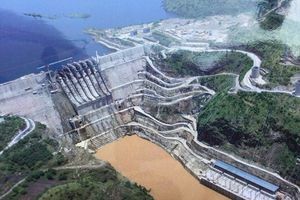 The channels are designed to transport water from the Dam to the zones in the Oromia Regional State and also to the Southern Nations, Nationalities & People’s Regional State (SNNPR). Some of the major projects executed by the Corporation in the country include Kesem Dam and Irrigation, Gidabo Dam, Megech Dam and the Tendaho Clean Water Supply project.